Ohio Governor John Kasich was recently in South Carolina. Kasich talked about all kinds of hot button issues — immigration, budget, Islamic state, gun rights. The one topic he tried to dodge is the one thing that is going to characterize his visit: Common Core. 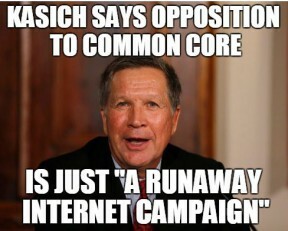 – Cincinnati.com, Kasich In SC – What’s wrong with Common Core? Governor John Kasich, thank you for speaking to millions of parents and citizens in the insulting manner to which Common Core opposition are now accustomed. The ignorance in those two statements alone should disqualify him from holding your current office, forget about anything higher than that. Common Core opposition is not simply a “runaway internet campaign”. Opposition is more than a meme. We’re parents, teachers, students, grandparents. Most of us can vote. Thanks for offering to be the new star, though. I’m sure Mr. Bush appreciates you taking the target off his back for a bit. It seems likely that what Kasich is doing in S.C. is angling for a VP nod. Mr. Kasich, thanks for giving us a snapshot of where Bush plans to take his Common Core narrative. “They always tell you, when you go into states like South Carolina, you’ve gotta be careful. Well, you know, that’s never been my style,” he told the crowd, which numbered 200, according to organizers. Yeah, you gotta be careful. Might turn into a runaway internet campaign. A bit of related news — According to a recent poll, support for Common Core is now in the toilet. Only 17 percent of Americans support the Common Core State Standards, according to poll data released Thursday by Fairleigh Dickinson University. This entry was posted in Common Core, GOP, LL1885, Random Musings, Shutuppery, Useful Idiot and tagged Election 2016, Governor John Kasich. Bookmark the permalink.